Your bullmastiff's strong prey drive doesn't make him likely to befriend cats. 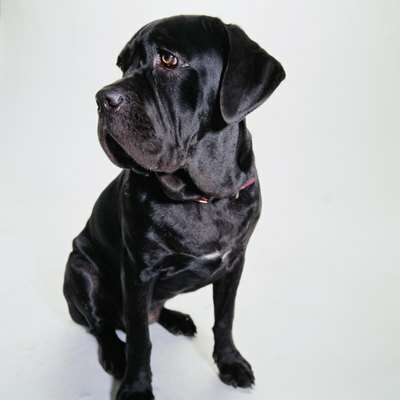 Weighing up to 130 pounds, bullmastiffs are among the biggest dog breeds. If you live with a one of these giants, you already know he can be a fearless guard dog or a sweet-natured cuddle bunny. He may not be so friendly, though, toward the neighbor's cat. The American Kennel Club's history of bullmastiffs reveals they were developed to guard game preserves and large estates from poachers. The characteristics that were desired back then and still remain in the large dogs today include being able to track prey stealthily and move quickly to pin their target and hold it --whether it be a poacher or other victim. Because of this high prey drive, many bullmastiffs can't live with cats. Your bullmastiff is an independent dog, bred to be wary of intruders -- including other canines -- and are commonly aggressive toward other dogs. The American Bullmastiff Association's website reports that males and females can get along, but that there will be trouble between a bullmastiff and any other dog of the same gender, regardless of the breed. Proper training and socialization of your bullmastiff is a requirement if he is to be calm and non-aggressive, and it can teach him to be tolerant if not friendly with cats. Vet Street advises starting his training the day you bring your bullmastiff home. Be prepared, though: his breed is known to be independent thinkers, dogs who may need a different approach to training than other breeds. Veterinarian Dan Rice writes of the importance of early and consistent socialization for bullmastiffs, noting the inbred influences to hunt, chase and pin prey and to fight with dogs and other animals can be overcome. Early and frequent exposure to new people and other dogs will teach your bullmastiff that not all strangers are bad guys and will also help him recognize other animals, including cats, as friends. Even though bullmastiffs are confident, fearless guardians, they make ideal family dogs with their loving nature and intelligence. They may be a good breed for a family with older children and teens rather than young children, however. The Purebred Puppy website cautions against bullmastiffs in homes with small children as the dog could inadvertently harm little kids during innocent play. Another concern is the bullmastiffs' protective nature; kids who are wrestling around and playing hard could be harmed if the dog perceives "his" child as being in danger and intervenes to stop it.